included a poem, "Sancte Claus Goed Heyligman!" picture of the saint to be made in America. full of toys and eight flying reindeer. first one was published in 1848 by Henry M.
copies of that paperback publication have survived. the Military Academy of West Point. beard hung down to his knees!" in a long green coat. It was the 1870 edition of "A Visit From Saint Nicholas"
that Santa wore red and that he lives in the North Pole. and through mail-order by Sears and Roebuck. "Santa Claus Headquarters" at Christmastime. 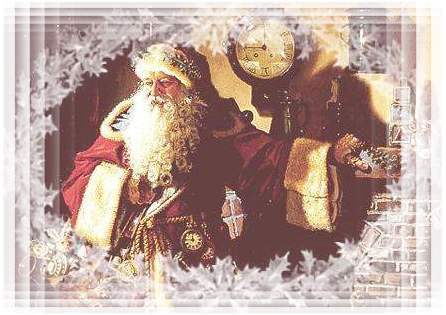 a cheerful voice and a hearty laugh, to be Santa Claus. whispered their secrets into his ears. post offices had overflowed with letters to Santa every year!